It should be a battle. El Rancho (17-14) finished third in the Del Rio League, but has been hot of late, winning four consecutive games, including upsetting No. 3 seed West Torrance (4-1) in the first round and beating Apple Valley (6-4) in the second round. The Dons are led by senior Jose Guerrero, who is hitting .367 and 14 RBIs, and Bobby Banuelos, who is hitting .307 with 12 RBIs. Montebello (20-11), which won the Almont League for the second consecutive season, counters with sophomore Jose Macias, who is hitting .562 with 21 RBIs, and Edgar Velazquez, who is hitting .370 with 15 RBIs. The Oilers advanced with wins over Santa Ana Calvary Chapel (10-1) and Century (8-1). La Mirada at Redlands East Valley >> The Matadores (23-7) are seeking their second trip to the semifinals during the past three seasons. La Mirada has won 13 of its last 14, including a 7-1 win at Rancho Cucamonga in Tuesday’s second round. The Matadores will give Jakob Gonzalez the ball today. The senior is 7-1 and threw five shut-out innings in a 1-0 win over Ayala in the first round. La Mirada also looks to junior shortstop Kevin Kendall, who is hitting .452 with 29 RBIs, and Daniel Jung, who is hitting .366 with 27 RBIs. Redlands East Valley (21-7) advanced with a 1-0 victory over No. 2 seed Gahr in the second round. Laguna Beach vs. Cal >> The Condors (20-9) are seeking their third consecutive trip to the semifinals. Cal has won nine of its last 10 and has done it with pitching, yielding a run or less in five out its past six games, including a 4-1 win over Fullerton in the second round. Senior Jakob Johnston, who is 7-1 with a 1.50 ERA, is expected to get the call today. The Condors also look to senior catcher Eric Sotelo, who is hitting .267 with 13 RBIs, and senior Jake Carmichael, who is hitting .365 and scored 16 runs. Laguna Beach (17-12) advanced with a 4-0 win over Patriot in the second round. Kaiser at Santa Fe >> The Chiefs (18-13) are looking to continue their best season in more than 20 years. But it will be a top challenge to oust the No. 2 seed Cats (25-3). Santa Fe, which shared the Del Rio League title with Cal for its first title in 22 years, looks to senior Robert Lucia, who is 8-2 with a 1.11 ERA. He threw a no-hitter in a 5-0 win over Grace Brethren in the first round. The Chiefs, who beat Rialto (3-0) in the second round, also look to Zach Penticoff, who is hitting .353 with 17 RBIs, and Luis Aguilar, who is hitting .361 with 14 RBIs. Kaiser advanced with a 13-1 win over Ramona in the second round. Cantwell-Sacred Heart of Mary at Paraclete >> The Cardinals (26-4) have a tall order in the No. 2 Spirits (22-4), who advanced with wins over Rubidoux (13-0) and Lompoc Cabrillo (3-0). CSHM, which has playoff wins over Ontario Christian (4-1) and Garey (6-0), are led by Jared Thomas, who is hitting .434 with 24 RBIs, and Andrew Quillen, who is hitting .370 with 20 RBIs. Santa Fe 3, Rialto 0 — Isaiah Gonzales pitched a complete game, striking out five for the Chiefs (18-13) in a CIF-SS Division 4 second-round victory. If last Thursday was a Thursday massacre when all but two area softball teams advanced to the second round of the CIF-SS playoffs, then Tuesday was payback for the area, which had all six of its remaining baseball team advance to quarterfinals, led by El Rancho beating Apple Valley, 6-4, in Division 4. La Mirada in Division 2; D4 entries Cal, Santa Fe and Montebello and Cantwell Sacred Heart of Mary in Division 5 all won to advance La Habra, ranked No. 4 in the state this week, routed Redlands East Valley, 8-4, to advance to the softball quarterfinals in Division 2. The only area team ousted was Montebello, which lost to Silverado in Division 5. PICO RIVERA — Vince Fuentes set a El Rancho High School school record for career wins Tuesday, but he was more excited about the team accomplishment – a win to earn a trip to the CIF Southern Section quarterfinals.Fuentes scattered nine hits to score his 21st career victory and the host Dons advanced to the Division 4 final eight with a 6-4 win over Apple Valley in a second-round game. 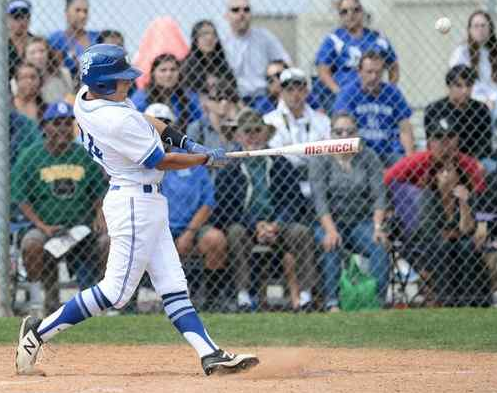 Fuentes, who moved past Chris Villalobos (2008) on the school’s all-time list, also had two hits to lead El Rancho, which won its fourth consecutive game to improve to 17-14. 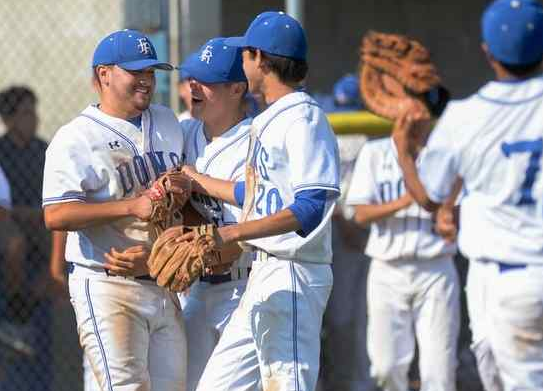 The Dons will visit Montebello, an 8-1 winner over Century, in Friday’s quarterfinals. Apple Valley finished 13-11. El Rancho, which upset No. 3 seed West Torrance in the first round, continued to show its confidence by overcoming an early deficit to score four runs in the second to lead 4-2 before getting two in the third for a 6-2 advantage. The Dons, after the Sun Devils went up 2-0 in the top of the second on consecutive doubles by Tanner Fuller and Joseph Vera, loaded the bases on consecutive singles by Fuentes, Rick Rizo and Johnny Banuelos before Matt Arellano tied it at 2 with a two-run double. Jason Vela followed with a RBI ground out for a 3-2 lead before Andrew Alvarez singled for the 4-2 advantage. El Rancho took advantage of two Apple Valley errors to push it to 6-2 in the third, which was highlighted by a RBI single by Banuelos (2 for 3). The Sun Devils cut it to 6-4, scoring a run on two errors in the fourth and a home run by Ryan Stephens in the seventh. Fuentes, who is 10-4 this season, then sent El Rancho to the quarterfinals by getting the next three batters. RANCHO CUCAMONGA >> Rancho Cucamonga senior pitcher Logan Rinehart is a fastball pitcher and La Mirada is a fastball-hitting team. So something had to give when the teams squared off in a CIF Southern Section Division 2 second-round contest. It was visiting La Mirada getting the best of the battle and prevailing 7-1 on Tuesday. The Matadors (23-7) advanced to the quarterfinal on Friday against Redlands East Valley, a 1-0 upset winner over second-seeded Gahr. The Suburban League champion Matadores racked up 14 hits while the Cougars (17-11-1), Baseline League runners-up, managed just three. The visitors struck early and never looked back, plating three runs in the second on the strength of five hits and a walk. The big blows in the inning were a two-run single by Omar Myzel and a run-scoring single by Matt Hickman. Hickman had another in the third to put La Mirada up 4-0. REDLANDS >> Even a back flare-up was not going to hold back La Habra junior Janelle Rodriguez on Tuesday.Rodriguez hit a go-ahead two-run home run in the second inning and later drove in two more on a single in the fifth to help top-seeded La Habra advance past Redlands East Valley 8-4 in a CIF Southern Section Division 2 second-round game. La Habra (28-1), ranked 17th in the latest Maxpreps Xcelllent 25 National Softball Rankings, will host Rio Mesa in the quarterfinals on Thursday, a day after five of its seniors graduate.